With a low-maintenance exterior and front-entry garage, this traditional charmer home plan promotes easy living. 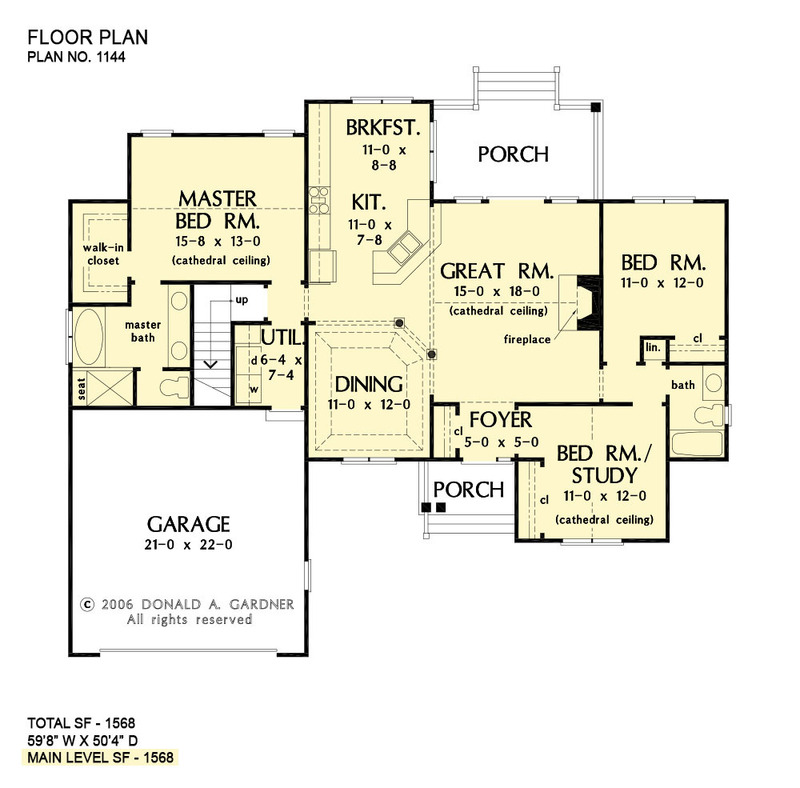 The family efficient floor plan is designed as a step-saver and allows a natural traffic flow. While a bonus room and study/bedroom provide flexibility to the home plan, custom-styled features include a cathedral ceiling in the master bedroom, study/bedroom and great room as well as a tray ceiling in the dining room. An angled cook-top counter and columns keep the common rooms open, and the fireplace is a focal point that beckons relaxation. The kitchen's eat-in breakfast area overlooks a rear porch for nice views during mealtime. The master suite is complete with a walk-in closet and well-equipped master bath with a double vanity, garden tub and shower. 1st Floor: 1568 Sq. Ft. 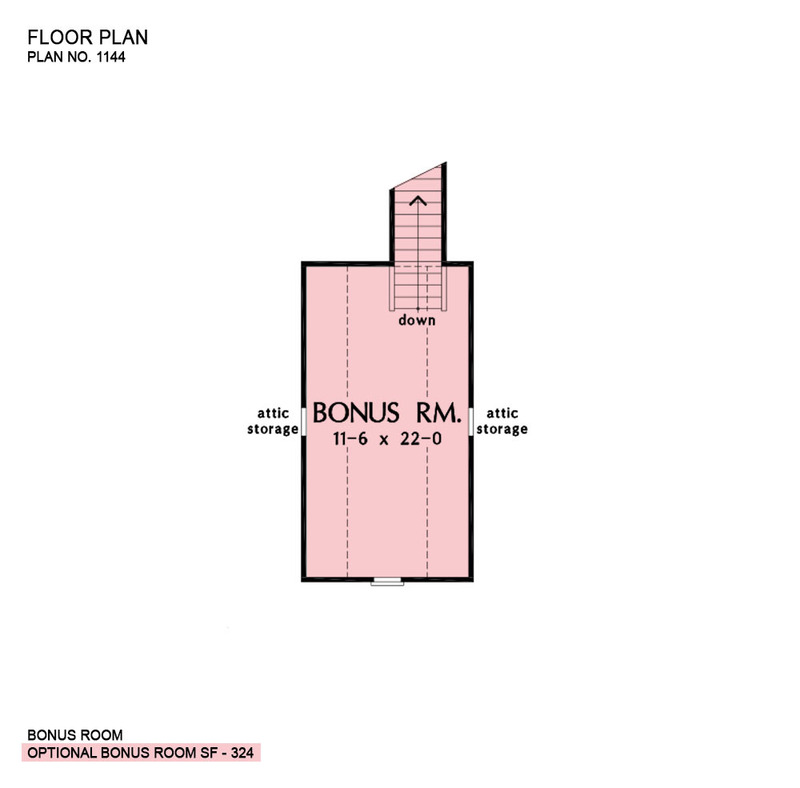 Bonus Room: 324 Sq. Ft.
House Dimensions: 59' 8" x 50' 4"
Master Bedroom: 15' 8" x 13' 0"
Bedroom / Study (Cathedral): 11' 0" x 12' 0" x 16' 4"
Bonus Room : 11' 6" x 22' 0" x 9' 0"
Breakfast Room : 11' 0" x 8' 8" x 9' 0"
Foyer : 5' 0" x 5' 0" x 9' 0"
Great Room (Cathedral): 15' 0" x 18' 0" x 17' 5"
Kitchen : 11' 0" x 7' 8" x 9' 0"
Master Bedroom (Cathedral): 15' 8" x 13' 0" x 15' 7"
Porch - Rear : 15' 4" x 9' 0" x 9' 0"
Porch - Front : 8' 8" x 4' 10" x 9' 0"
Utility Room : 6' 4" x 7' 4" x 9' 0"